Jeff Nichols is slowly but surely becoming one of the select few filmmakers to seriously keep an eye on in the near future. So far in his filmography, he’s had nothing but critical hits like Shotgun Stories, Take Shelter and Mud (and will also be releasing multiracial love story Loving later this year), all of which have thrived on minimalist dialogue and telling the story mostly through visuals and other clever devices, leading to many drawing comparisons to the likes of Mark Twain and even Stanley Kubrick in terms of storytelling. 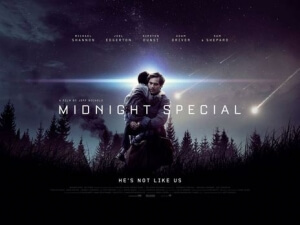 His latest film is also his biggest to date, and right from when word first got out about it the pressure has always been on for Midnight Special to finally assert Nichols as one of the new bright talents out there. Does it live up to that potential? Not always, but the majority of it does at the very least put him in a stronger position to truly break out more than ever. To go into too much detail about the plot could potentially give away some of its mystery, so we’ll do our best to just give you the basics: a boy named Alton (Jaeden Lieberher), who we first meet with goggles covering his eyes and thick headphones around his ears (to say why would, once again, be a spoiler) is abducted from a religious commune by his father Roy (regular Nichols collaborator Michael Shannon) and his childhood friend Lucas (Joel Edgerton), with members of the cult and soon the FBI eager to recover the boy for their own nefarious and sometimes sinister purposes. As we slowly discover, Alton is far from normal, maybe even other-worldly, but that’s where we’ll leave it for now; this is a film that demands to be seen with as fresh eyes as possible, and if you’re at all curious about this set-up and where it may eventually lead then you will find yourself utterly spellbound by its twists and turns throughout. If not, then you will most likely appreciate it for what it is but nothing more. We’re half-and-half; there are parts of it we definitely found gripping and even fascinating, while others not so much – in fact, as we think more about those lesser moments the more we start to realise they probably let the film down more than we were hoping, but not to a point where the movie is completely ruined because of them. What’s good about the film is that Nichols, as a director, once again establishes a particular mood that is consistent throughout the film, keeping things mysterious enough to make you keep guessing what’s going to be uncovered, but also packed with a fair amount of heart that makes you care about what’s happening and who it’s happening to. He also makes good use of themes, particularly the religious angle which can certainly spark debate over the right thing to put your faith in and the levels that some tyrants will go to in order to maintain order and peace for the masses, and also the fears that parents experience about their children perhaps being too good for this world, raising the argument of whether it’s a selfish or selfless act to let them carry out their purpose in life without interfering. The acting is solid from everyone in the cast, cinematographer Adam Stone – another regular collaborator with Nichols – creates some beautiful shots from even the darkest of environments, and David Wingo’s score is trippingly atmospheric. Make no mistake, it is a very well-made movie by all accounts. However, our main problem lies in Nichols’ script. Not so much for the handling of themes and ideas, but more for how it slowly builds up towards this grand payoff to everything before it but said payoff never fully arrives. There is definite ambition in there, but this script is ultimately laden with bare characterisation and enough important speeches to make Christopher Nolan wet himself in excitement, with a third act that can’t help but underwhelm when you consider all the build-up prior to it. By no means is it a terrible script, but it frustrates you just how much it’s preventing this film from being the absolute masterpiece it could have been. Although Midnight Special isn’t the godsend we had hoped it to be, it should still be yet another mostly-solid entry into Nichols’ filmography that should put him in good standing for the years to come. Midnight Special is a mostly-solid new entry into Jeff Nichols’ filmography, but while it thrives on its minimal direction, strong acting, and beautiful cinematography among other positives, the script which doesn’t entirely live up to the film’s promise prevents it from being his masterpiece.